The biggest change these past two weeks was changing the behavior of the CRM checkbox. Previously, the box was “sticky”, remembering your preference from your previous email – if you checked the CRM box in your last email, the CRM box will be checked in your next email. This behavior resulted in people forgetting to check the CRM box and therefore not sending the email to CRM. Many reps have told us that if they don’t log activity for an account or opportunity in Salesforce, they lose the lead. We set out to help our users log emails more consistently in Salesforce, and with our users’ feedback, we decided to make the CRM box default to checked for our Team and Enterprise customers that use “Send to Salesforce”. We also thought that our Free and Plus users would want this new behavior for BCC to CRM. Within hours you wrote in to tell us that you preferred the old behavior, so we quickly reverted the change for our Free and Plus (BCC to CRM) users. Thanks for the immediate feedback! 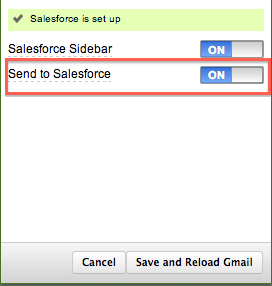 For Send to Salesforce users worried about forgetting to uncheck the CRM button and accidentally syncing personal emails: if the contact isn’t in Salesforce, or if the email is internal-only, it won’t get sent to Salesforce. – The email address in the Salesforce Sidebar is now properly displayed as read-only. What do you think of our changes? What can we do to help you log activity into Salesforce more consistently and automatically?